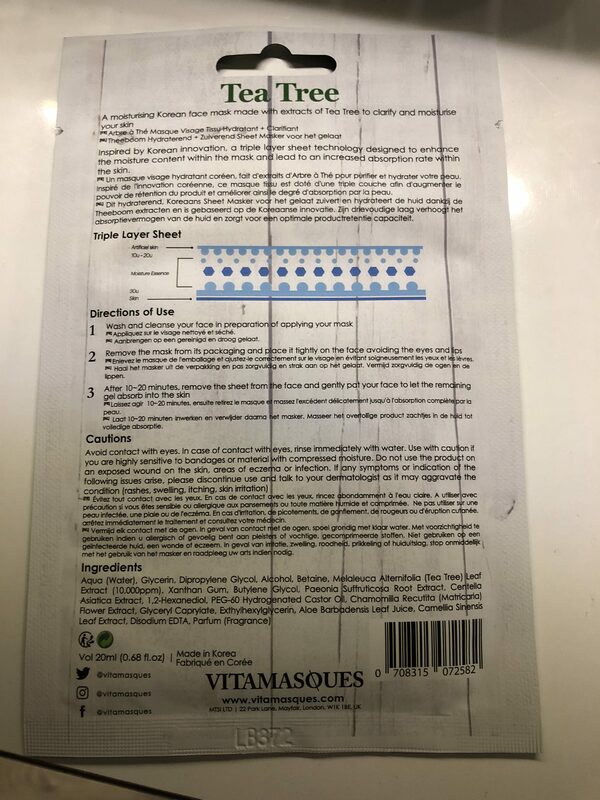 This is the first time I have used a Vitamasques sheet face mask. 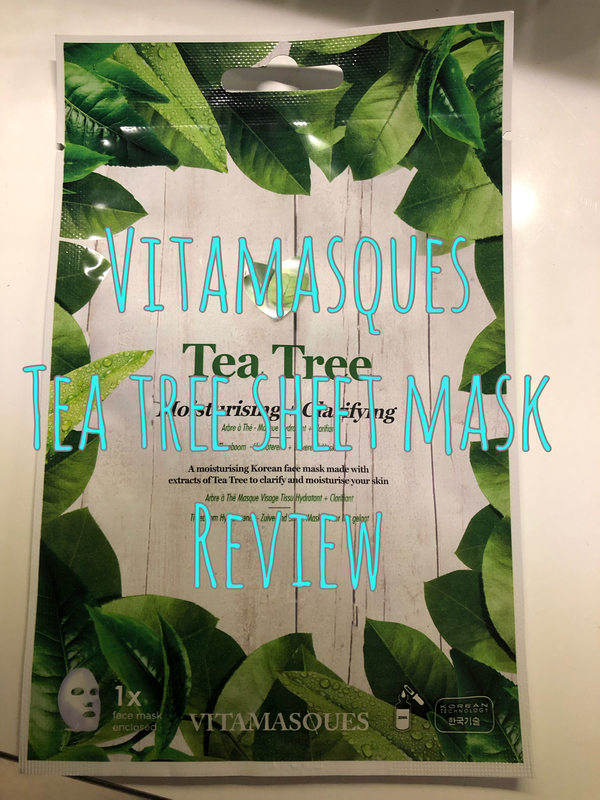 I received this in my buddy box for February, a box I buy on a monthly subscription and I decided to review this today as part of my Face Mask Friday series. We will start by saying as the weather can’t decide if its Spring or Winter my skin is very dry but I use my day and night face creams regularly. I am also suffering with what we seem to think is eczema, but really half the time its embarrassing as its looks like you’ve dribbled down the side of your face. Of course I am applying cream to this more regularly. 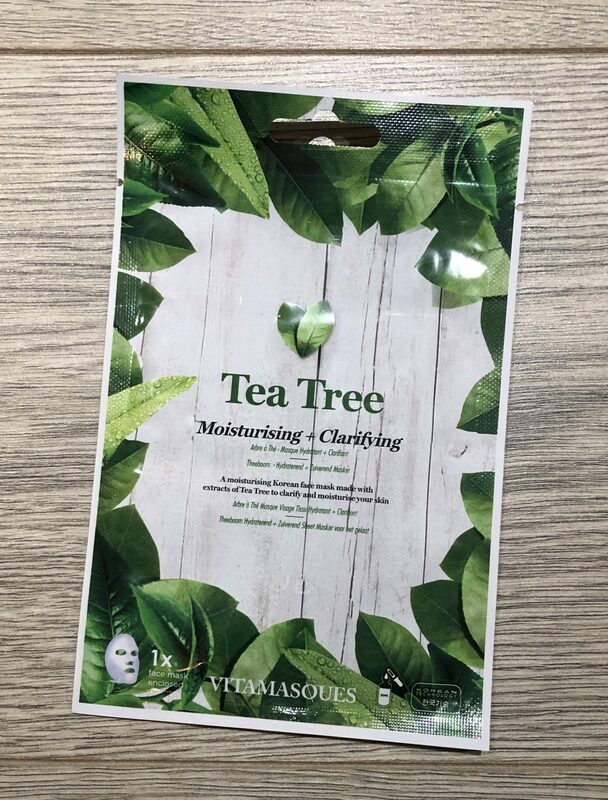 Tea tree is something I know is very good for you, I haven’t ever tried a face mask with tea tree in but I have used it in shampoo. I am not really a lover of the scent of tea tree. You can really smell this as you get it out the packet and as you apply the sheet. After a while you either get use to the smell or the smell weakens. Before applying the face mask sheet, I read the instructions on the back, washed and cleansed my face. When opening the mask not only was the smell strong, there was a lot of liquid or moisture to the sheet. Which seemed more than a usual mask would have. Anyways I took the sheet out and following the instructions I applied this to my face. 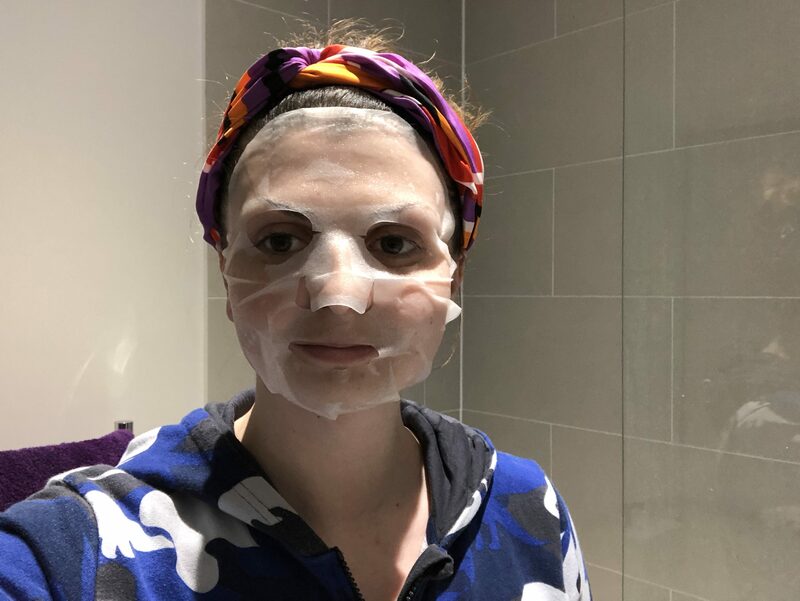 I must have a small face but all sheet face masks seem to big for my face. Once I was fiddling around to make the mask fight best I was finding my hands gaining the liquid texture from the mask. I had to wipe my hands several times whilst applying to my face. Once it was in the right position it was fine and I could go watch tv whilst it worked its magic. You can probably tell from the above picture that it’s not the best fit. For me anyway. I went off and as the instructions state left it on for 10-15 minutes. By the 10 minutes I was ready to take it off as my eyes seemed like the mask had slipped slightly on to my eye. I did keep adjusting it to let the mask work to its full potential. When I took the mask off, my skin felt good, moisturized and my eczema had cleared a little the next day. Whether that’s the mask or the extra cream I am putting on I am not sure. Having said the work has worked to what its meant to which is to moisturize and clarify your skin. I feel as the days have passed my skin seems to be drying out quicker. Again this might not be the mask it could be the fact the weather is warmer. Based on this one time use of this mask, I would like to give it a second try to see if it works better next time. But If that time it didn’t improve my skin for longer than I think I would pass this. Plus the smell really isn’t the best which has put me off. What is your favourite face mask? Any suggestions for me to try?